I received an interesting email last week about my Friday Business Times piece on the would-be Oscars of dining (subscriber-only link for next three weeks: Oscar sits down to dinner). The writer disagreed that San Francisco is lacking in high-profile restaurants compared with several years ago. The closure of Stars, Cypress Club and Redwood Park after the dot-com bubble burst had more to do with poor management than macro trends, he said. There's some truth in that point -- the examples I picked may not have died due entirely to dot-com issues, maybe not even primarily. But it's hard to argue there was not a major impact from the dot-com downturn. At the very least, it pruned restaurants that had been propped up by dot-commie expense account business. After all, the city lost a net 228 restaurants in the last six months of 2001, according to a widely quoted study from the Golden Gate Restaurant Association. Interesting story about those numbers, though. They are sourced to the Department of Public Health, which licenses restaurants. They tend to wax and wane. I pulled some in 2003, trying to update the GGRA's 2001 numbers. The department told me they pull together reports on an on-demand basis, meaning there are no regular reporting periods. 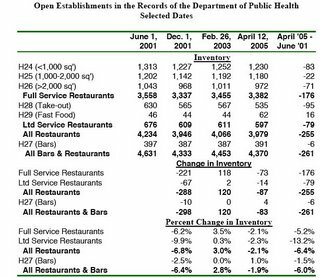 So basically it's tough to do comparisons -- you can say how many restaurants opened or close in a particular period, but can't readily compare to the same period in prior years. So if you're looking at six months of data, you may be looking at seasonality. 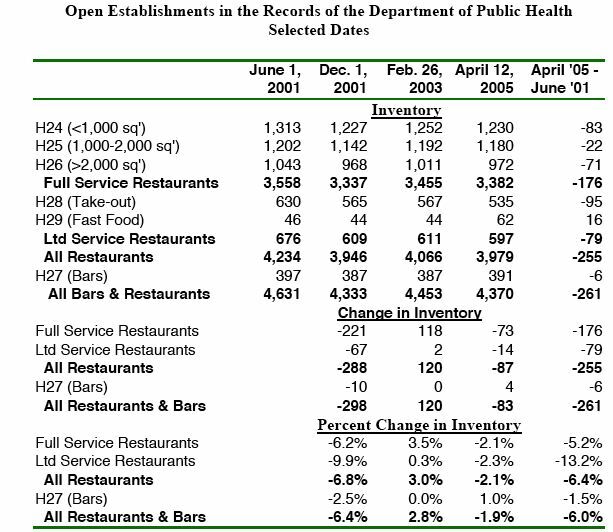 My 2003 article looked at one full year of statistics, and found a net 127 restaurants had opened in San Francisco. But it was still flawed, because it did not state how many restaurants had opened or closed the year before that or the year before that. What if the net gain of 127 was compared with net loss of 400 the prior year? Bottom line, no one really has good data on the financial state of the restaurant industry at any given time. The hotels report hard numbers into PKF Consulting and Smith Travel Research, but restaurants have no such statistical aggregators. Credit card companies like Visa could probably put together some good data but do not part with such information. Outsourcing: the new small plates? Reporter promotes self; film at 11.